Objective: To evaluate the causes of medication list inaccuracy, implement intervention to enhance overall accuracy of medication lists and measure the sustainability of the intervention. Methods: A prospective study of patients seen in an academic, ambulatory primary care internal medicine clinic. Before the intervention, baseline data were analysed, assessing completeness of medication documentation in the electronic medical record. The intervention consisted of standardising the entire visit process from scheduling of the appointment to signing of the final clinical note by the physician. Each healthcare team member was instructed in her role to enhance accuracy of the documented medication list. Immediately after the intervention, a second data collection was undertaken to assess the effectiveness of the intervention on the accuracy of individual medications and medication lists. Finally, a year later, a third data collection was undertaken to assess the sustainability of the intervention. Results: Completeness of individual medications improved from 9.7% to 70.7% (p<0.001). However, completeness of the entire medication lists improved only from 7.7% to 18.5%. The incomplete documentation of medication lists was mostly due to lack of route (85.8%) and frequency (22.3%) for individual medications within a medication list. Also, documentation of over-the-counter and “as needed” medications was often incomplete. The incorrectness in a medication list was mostly due to misreporting of medications by patients or failure of clinicians to update the medication list when changes were made. Conclusion: To improve the accuracy of medication lists, active participation of all members of the healthcare team and the patient is needed. As the American population ages, an increasing number of people will be living with chronic diseases. The trend has been to shift the care of chronically ill patients who have marked exacerbation of their medical conditions from hospitals to ambulatory settings.1 Admission to hospital is being reserved for severe acutely ill or higher-risk ill patients. Moreover, it has been found that inaccurate medication lists in an ambulatory clinic cause a larger number of fatal adverse drug effects (1 of 131 outpatient deaths) than in a hospital setting (1 of 854 inpatient deaths).5 Therefore, ambulatory settings would benefit from implementation of system-designed techniques to enhance the accuracy of medication lists for patients who take multiple medications. Most previous studies examining the accuracy of medication lists were conducted in a hospital setting.7,8,9,10,11 Very few studies have been performed in an outpatient setting.3,4,12 The latter studies were observational and showed that the level of accuracy of medication lists was similar between electronic medical records (EMRs) and paper records. This finding suggests a need to redesign the process of care in outpatient practice to improve the accuracy of medication lists. The aims of our prospective study were to identify the causes of inaccurate medication lists, to design interventions to deal with the problem, and to improve the accuracy of the lists and, thus, patient safety. This prospective study was conducted from April 2005 to April 2006 in one section of a primary care internal medicine clinic in the Division of Primary Care Internal Medicine at Mayo Clinic Rochester. The clinic comprises eight staff physicians and 23 resident physicians, who together provide care for about 1200 primary care patients a month. This study was approved by the Mayo Clinic Institutional Review Board. Mayo Clinic Rochester has an EMR with a Mayo-developed clinical notes application called a document browser. All visits are recorded in the document browser. The medication list is contained within each note and is entered into a free text field with no interface to decision support or order entry. Any patient with a physician’s appointment in the primary care internal medicine clinic was eligible for the study, even if they were taking no medications. However, patients who previously had refused to give consent for the use of their records for research or who were unable to communicate by telephone were excluded from the study. Data were collected from three periods: pre-intervention, immediately post-intervention and a year after the start of this study (sustainability). Patient selection consisted of randomly selecting and reviewing the clinical notes of 10 patients daily from the pool of all patients seen each day in our clinic, using a table of random numbers. Pre-intervention patient selection consisted of reviewing randomly selected electronic clinical notes of 65 patients evaluated in our primary care internal medicine clinic during April 2005. Immediately after the intervention, randomly selected clinical notes of 100 patients were reviewed in July 2005 (post-intervention). To determine the sustainability of the intervention, randomly selected clinical notes of 65 patients were reviewed in the first trimester of 2006 (sustainability). An individual medication was defined as “complete” if the name, dose, frequency, and route of administration were documented. A medication list was defined as “complete” if all four components were documented for each individual medication in the medication list. The completeness of an individual medication and the medication lists was assessed by abstracting the information from the EMR. A medication list was defined as “correct” if there was no discrepancy in the name, dose and frequency between the current medication list documented in the EMR and the medications the patient was actually taking at home. An individual medication was defined as “correct” if there was no discrepancy in the name, dose and frequency of an individual medication item. An individual medication is defined as accurate when its is both complete and correct. The Institutional Review Board permission to call patients at home was granted on July 2005. Therefore, a baseline data collection for correctness was obtained during the first half of July (correctness pre-intervention). An intervention was implemented and a second data collection was conducted during the second half of July (correctness post-intervention). To assess the correctness of the medication list of each patient, each selected patient was contacted at home and asked to read from their medication containers the name, dose, frequency, and route of each medication he or she was currently taking. This information was compared with that documented in the patient’s EMR. Patients were excluded from the correctness portion of the study if they were not contacted within 5 days of their index visit. The completeness portion of this study had three different measurement periods. The first measurement, or pre-intervention measurement, determined how often documented medication lists were complete and the major types of incompleteness. This was followed by an intervention, implemented in July 2005. The impact of the intervention on the accuracy of individual medications and medication lists was reassessed (post-intervention measurement). Finally, to assess the intervention sustainability, a third measurement was undertaken about a year after the start of the study (sustainability measurement). The major types of incompleteness for medication lists were identified after the pre-intervention data collection. Data collected were analysed and the findings communicated to a multidisciplinary team consisting of physicians, nurses, administration, and allied health professionals. Review of the rooming process of patients showed that our primary care internal medicine clinic had two different rooming processes. Patients were usually put in an examination room by a licensed practical nurse (LPN), who reviewed the medications with the patient and entered an updated medication list into the EMR as a preliminary note. However, occasionally, the patient was put in the examination room by a clinical assistant and the physician was responsible for reviewing and updating the medication list and dictating a note. In both cases, the physician was responsible for reconciling the medication list with the patient during the visit. When the appointment was being scheduled the appointment secretary reminded the patient to bring an updated list of medications or medication containers to the appointment. When the patient arrived for the appointment, the receptionist gave the patient a form to record all medications in case the patient had not brought the medication containers or an updated medication list to the appointment. An LPN was trained to record all four components for each medication in a preliminary electronic note. The physician was advised to reconcile and update the medication list in the electronic note if he or she made any additions, deletions, or revisions to the list. A transcriptionist was asked to check with the physician if any discordance between the physician’s dictation and the medication list was noted in the clinical note. The overall impact of all the multiple interventions on the accuracy of the medication list was measured; not, the impact of each individual intervention separately. A third data collection was done in the first trimester of 2006 to determine the sustainability of the intervention. Between August 2005 and the first trimester of 2006, the definition of medication reconciliation and what constituted a complete and correct medication list was reinforced twice: first, by an institutional communication to all employees and second, by an internal email communication to the LPNs. Univariate comparisons between study phases were made using two-sample t tests for continuous variables and χ2 tests for categorical measures. In this study, the statistical analysis took into account that most patients have multiple medications by using generalised estimating equations within a logistic regression model. Analysis was performed on three sets of medications: (a) all medications; (b) prescription medications only; and (c) prescription and scheduled medications only. Prescription medication was defined as any medication that needed a prescription by a physician/nurse practitioner/physician assistant for the purchasing of the medication within the United States—that is, all medications excluding over-the-counter medications. Scheduled medications were defined as medications that had to be taken at regular intervals of time. The minimum sample size to obtain a significant improvement in medication list accuracy with 80% power was found to be 65 in each phase. The statistical software package SAS (SAS Institute Inc., Cary, North Carolina, USA) was used for data analysis. Table 1 lists the clinical characteristics of the patients participating in the completeness arm of the study. No significant difference was noted among the pre-intervention, post-intervention and sustainability measurements. The mean number of medications taken by patients ranged from 6.6 to 7.5, of which approximately 35% were over-the-counter and 4% were taken on an “as-needed” basis for symptoms. Older patients were noted to take more medications than younger ones and women, on average, took more medications than men. 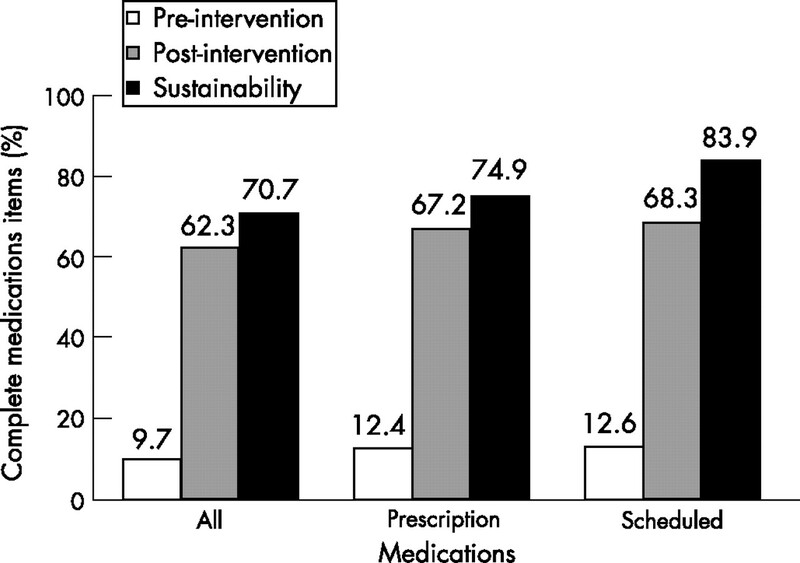 The number of complete individual medications and the number of complete medication lists increased at post-intervention and sustainability phases of the study (table 2). As a result of the intervention, there was a significant improvement in the documentation of medication dose and route (p<0.03). Also, documentation of dose significantly improved at the sustainability phase of the study (p<0.001) as shown in table 2. Individual medications and medication lists for all medications were found incomplete more often than those for prescribed and scheduled medications. The completeness of both medication lists and individual medications improved even further when prescription and scheduled medications were analysed (fig 1). Improvement in completeness of all individual medications, prescription medications, and prescription and scheduled medications. 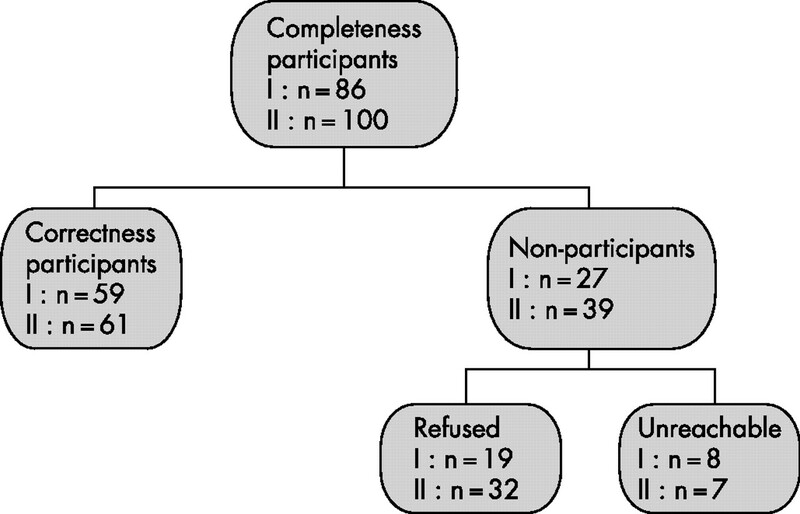 Not all patients selected to participate in the completeness portion of the study agreed to participate in the correctness portion of the study (fig 2). Sixty-nine per cent of the eligible patients agreed to participate in the correctness pre-intervention phase (59 out of 86 patients contacted), while 61% of eligible patients agreed to participate in the correctness post-intervention phase (61 out of 100 patients contacted). Of all the patients who agreed to participate in the correctness phase, 65% were contacted on the same day as the visit to the outpatient clinic, and the other 35% were contacted within 5 days after their latest visit. Distribution of participants and non-participants in completeness and correctness portions of the study. I = Pre-intervention; II = post-intervention. When comparing correctness pre-intervention and post-intervention groups, differences between the clinical characteristics of patients whose medication lists were assessed for correctness were not significant. However, several clinical differences were noted between participants and non-participants in the correctness portion of the study. The participants were younger, less likely to have been evaluated by a staff physician, and were taking fewer medications. The major reason a medication list was incorrect was the current EMR list included medications no longer taken by the patient. Incorrect dose and frequency of medications were also causes for the list being incorrect. In addition, when contacted at home, patients reported taking medications that were not listed in the EMR medication list. Comparison of data collected pre- and post- intervention showed no statistically significant improvement in the correctness of individual medications or medication lists (table 3). This study showed that significant improvement in the completeness of the documentation of individual medications and lists in an outpatient primary care practice can be achieved in a short time by involving and training all members of the healthcare team and standardising the rooming process. Even though, the assessment of morbidity and mortality due to inaccurate medication documentation was not examined in this study, it is clear that of the four elements required for a complete individual medication, discrepancies of name, dose and frequency are most likely to be associated with patient morbidity and mortality than discrepancy in route. The observed improvements on dose and frequency could probably be attributed to the education and diligent effort of the LPNs and physicians on obtaining dose and frequency of over-the-counter and as-needed medications from their patients. There may also have been an cumulative benefit over time, as patients returned to the office more than once after the intervention was started, allowing for additional editing of the medication list. Improving the correctness of medication lists is especially challenging because it requires the active participation of patients. Previous studies have shown that less than 30% of patients dismissed from hospital can communicate accurately about the medications they take.13 Therefore, as might be predicted, the majority of patients in our study did not bring a medication list or medication containers to the appointment with the physician, even when reminded by the appointment secretary. One possible explanation is that patients might have had the erroneous impression that the physicians had an accurate list in the EMR. Therefore, patients did not think it necessary to have a list or to bring their medications to the appointment. This indicates that healthcare organisations need to improve educational efforts aimed at helping patients understand why medications have been prescribed and why they should be knowledgeable about the medications they are taking. Our study showed that the major causes of inaccurate medication lists are misreporting of medications by patients and the failure of clinicians to update the list, including the addition and deletions of agents. This is in agreement with the findings reported by Bedell et al3 and Wagner and Hogan.12 Furthermore, 83% of the medication lists were incorrect at the post-intervention phase and 81.5% at the sustainability phase. These values also are in agreement with those of Bedell et al,3 who documented a 76% discrepancy in medication lists. However, in their criteria, Bedell et al did not include documentation of the route of administration. Furthermore, in contrast to Bedell et al, we found a smaller percentage of discrepancies due to (a) failure to record medications that patients were actually taking (this study 8.3% vs Bedell 51%); (b) inclusion of medications on the list patients were not taking (this study 12.2% vs Bedell 29%); and (c) incorrect dosing of medications (this study 19.1% vs Bedell 20%). An expected finding was the difficulty in obtaining from patients an accurate list of over-the-counter and unscheduled medications. Under-reporting of dietary supplements and over-the-counter medications has been described by Hensrud et al.14 Patients often struggle to remember the name, dose, and frequency of these types of medication, perhaps because they do not consider them medications or because they take them so infrequently they do not remember them, or for both reasons. Continuing discussion with patients about the importance of documenting all the medications they take and identifying optimal aids to help patients keep the list accurate— for example, by providing access to the EMR from home and the ability to edit the list, are areas for clinical improvement. To improve medication completeness further a future study might possibly focus on personalised feedback to the LPN. In addition, the LPN could be asked to reinforce with the patients the importance of bringing in their medication containers or an updated list of medications to each visit. Our prospective study had several limitations. Because the intervention was implemented for our entire primary care internal medicine practice, we had no corresponding control group to compare with the post-intervention group; however, the pre-intervention measurement can be used as a historical control. The results were based on a single primary care internal medicine practice, which may not be generalised to other practice settings. The correctness evaluation during the sustainability phase of this study was limited by the difficulty of reaching patients by telephone at home within the 5 day limit of the protocol. Lastly, in this study, the “gold standard” for correctness evaluation was direct communication with patient and not the pharmacy database. The results of this study showed that significant improvement in the complete documentation of the entire medication list and individual medications in an outpatient primary care practice can be achieved in a short time by involving and training all members of the healthcare team, by providing performance feedback, and by standardising the rooming process. Further improvement in the accuracy of the medication list can be achieved by providing performance feedback to individual members of the healthcare team, giving them personalised input about their performance, and educating them in areas of deficiency. We acknowledge Ms Holly. VanHouten for reformatting the database to be used in SAS and helping with the statistical analysis. Editing, proofreading, and reference verification were provided by the Section of Scientific Publications, Mayo Clinic. Phillips DP, Christenfeld N, Glynn LM. Increase in US medication-error deaths between 1983 and 1993. Lancet1998;351:643–4. Lo A, Ryder K, Shorr RI. Relationship between patient age and duration of physician visit in ambulatory setting: does one size fit all? J Am Geriatr Soc2005;53:1162–7. Bedell SE, Jabbour S, Goldberg R, et al. Discrepancies in the use of medications: their extent and predictors in an outpatient practice. Arch Intern Med 2000;160:2129–34. Ernst ME, Brown GL, Klepser TB, et al. Medication discrepancies in an outpatient electronic medical record. Am J Health Syst Pharm 2001;58:2072–5. Kohn LT, Corrigan JM, Donaldson MS, Institute of Medicine, editors. To err is human: building a safer health system. Washington: National Academy Press, 2000; (DC). Federico FA, Horack CL, Segars MG, et al. Reducing adverse drug events using medication reconciliation across systems. Presented at IHI National Meeting, Orlando, Florida, December 2005. Hallas J, Gram LF, Grodum E, et al. Drug related admissions to medical wards: a population based survey. Br J Clin Pharmacol 1992;33:61–8. Huic M, Mucolic V, Vrhovac B, et al. Adverse drug reactions resulting in hospital admission. Int J Clin Pharmacol Ther 94 32:675–82. Cornish PL, Knowles SR, Marchesano R, et al. Unintended medication discrepancies at the time of hospital admission. Arch Intern Med 2005;165:424–9. Whittington J, Cohen H. OSF healthcare’s journey in patient safety. Qual Manag Health Care2004;13:53–9. Gleason KM, Groszek JM, Sullivan C, et al. Reconciliation of discrepancies in medication histories and admission orders of newly hospitalized patients. Am J Health Syst Pharm 2004;61:1689–95. Wagner MM, Hogan WR. The accuracy of medication data in an outpatient electronic medical record. J Am Med Inform Assoc1996;3:234–44. Makaryus AN, Friedman EA. Patients’ understanding of their treatment plans and diagnosis at discharge. Mayo Clin Proc 2005;80:991–4. Hensrud DD, Engle DD, Scheitel SM. Underreporting the use of dietary supplements and nonprescription medications among patients undergoing a periodic health examination. Mayo Clin Proc1999;74:443–7. Funding: A Mayo Foundation CPI-10 grant. Presented as a poster at the SGIM 29th Annual Meeting, Los Angeles, California, USA 28 April 2006.